Adventure calls once again! This time our intrepid band of adventurers from Canada will be in the land of the Incas. 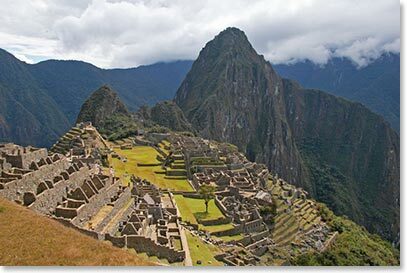 Perhaps no location on earth conjures up as much mystery and fascination as the ruins at Machu Picchu. It has been just over 100 years since Hiram Bingham from Yale University “discovered” this renowned site while looking for “Villacabamba”, the lost last refuge of Monaco Inca. It’s an important birthday year for Rob Macdonald. He has invited a very special group of friends and family to join him with Berg Adventures in the Andes. There are repeat offenders along the trail with Rob this time: Gordon, Chuck, Elaine, Leah are veterans of adventures in Russia, Nepal and Argentina. This time the circle expands to include Susan, Sandy, Tina, Paula and Lynn. We’ll hike the fabled trails that approach Machu Picchu, visit villages in deep valleys that cut into snow-capped peaks. We are going to spend a night at the only lodge at the Machu Picchu site and we will end our trip walking the cobbled, colonial streets of Cusco, which rest against the ancient rock walls that have awed and perplexed outside visitors for the last 500 years. Tune in daily for photos and stories. This is going to be great fun. September 22, 2016 – And Our Adventure Continues!